The Efest LUC V4 is a high quality universal smart charger. The EFest LUC V4 4-Bay Universal Battery Charger has four built-in independent charging channels. 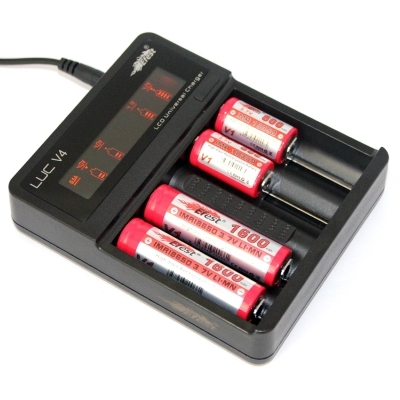 The V4 automatically detects Li-ion, Ni-MH and Ni-Cd batteries. Intelligent charging circuitry selects the optimal charging mode (CC, CV and dV/dt). The integrated digital LCD screen clearly displays charging progress, voltage, current and time while an intelligent automatic power-off function terminates current when charging is complete. Capable of charging 4 batteries simultaneously. Each of the four battery slots monitors and charges independently. Automatically stops when batteries are fully charged. Mini LCD screen displays precise voltage and battery capacity level. Automatically adjust discharge current to charge batteries of different sizes. Over-discharge Protection - Once the external power is connected with LUC V4 charger, charger will stop charging when batteries are full. Reverse Polarity Protection - While the charger is connected, each charging channel has reverse polarity protection. DC Wide Voltage (12-24V) Charging Mode. 0.5A and 1A can charge up to 4 pieces of 10440/14500/14650/16340/16650/17650/17670/17350/18490/18500/18650/26650. 2A can charge up to 2 pieces of 26500 and 26650 batteries. It can charge 15270 or 14250 batteries with spacers. 1. Only recharge these batteries with the intended charging cable or adapter. Using chargers with incorrect voltage or current can cause a fire or catastrophic failure. Since we have no control over how a buyer uses the device; no guarantee, warranty, or return privilege will apply, unless the product does not function the first time used (DOA).